An opportunity for the dogs to show off their "Barkie Fever"! 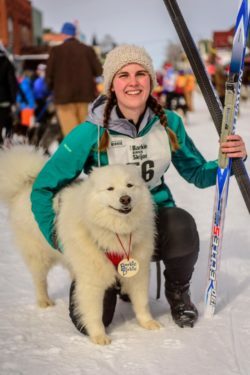 This event is a great opportunity for skiers and spectators to enjoy the sport of Skijoring and for the dogs to show off their “Barkie Fever”! 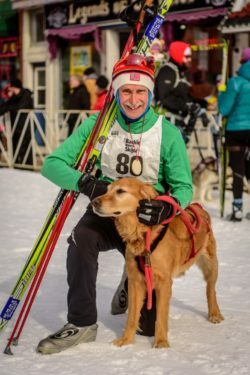 Skijoring combines cross country skiing with dog power. The skier is attached to his/her dog with a belt and towline. The dog then runs ahead as the skier skis. Skijoring is a team sport which allows both human and canine counterparts to exercise and enjoy the great outdoors. Skijoring is derived from the Norwegian word skikjøring meaning ski driving. The sport has been around for hundreds of years and originally started using reindeer and wooden skis. The sport also uses horses, but dogs are now the most common animal used in skijoring. Most medium size dogs (30 pounds and up) who are trained properly can be candidates for skijoring. Online registration closes on Tuesday, Feb. 19 at 11:59 pm. Race day registration is available (unless race is full) at the Celebration Tent from 8:30 am until 9:45 am. Skiers must be at least 13 years old on race day. The 5K is for fast, experienced teams that can finish a 5K race in 25 minutes or less. The 3K is for novice, slower, or inexperienced teams that can compete a 3K race in 40 minutes or less. The race starts at the intersection of Main & 2nd Street in Hayward and heads up Main Street to 6th Street. The course then turns left onto 6th Street and right onto the fields behind the Hayward Primary School. From there a large loop circles the Hayward Golf Course. At the completion of the loop the 5K Skijorers will ski a second lap of the same loop. The 3K Skijorers will complete only one lap on the golf course. After completing the required number of laps racers retrace their route back to 6th Street, turn right on Main Street, finishing at the start area. All dogs must be sufficiently fit to be able to complete the course without risk of injury. Dogs must be healthy and have up-to-date vaccinations. Spectators are welcome to park in the Spectator Parking Lot on Hwy B and take continuous bus service to the Celebration Zone. See the Event Guide for times of bus service. Entry is limited to one person + 1 dog. Skijorers may ski using either skate or classic technique. Loose dogs are not permitted at any time. Aggressive dogs are prohibited from the event. Waste is the dog owner’s responsibility and before or after the race it must be picked up immediately. Skate or classic skis are allowed. Metal ski edges are not permitted. Skijor belt is required and must be padded. Towline must use internal bungee. The distance between the skijorer and the dog should be between 7 feet and 13 feet and 8 inches. A pulling style dog harness is required with padding around the neck area. Each dog must wear a snug fitting dog collar. Under no circumstances can the towline be attached to the dog’s collar or any harness not specifically designed for pulling. The Barkie Birkie is one of the action-packed Thursday Thrills events. Warm up is limited only to the golf course portion of the course in the direction of race travel. Access to the golf course is behind the Hayward Intermediate School on 5th Street, only two blocks from the bib pick up tent in the Celebration Zone. The race will be an “interval start”, with teams starting in pairs at 15 second intervals. All teams should arrive at the start line at least 15 minutes before their race. Skijorers must provide their own handlers if there is any concern about maintaining adequate control in the start area. The front tips of the skijorer’s skis must be behind the start line prior to the signal to start. The dog may start “lined out” ahead of the start line. The skijorer’s race bib must be visible to race officials. Skijorers must stay to the right if facing an oncoming team. The skijorer must shout “Trail”, “On your left”, etc. before attempting to pass. The skijorer being passed should slow and move to the side of the trail, if possible. The skijorer being passed should stop poling and hold their poles behind, low, and away from the passing team. Skijorers must exhibit care, good judgment, and fairness whenever passing occurs. Skijorers must exit the finish area as soon as possible. Personal dog handlers are welcome at the finish area but must stay clear of finishing team traffic. The top three men and women in both Skijoring races–the 5K and 3K–will receive awards and all pre-registered skiers will be eligible for great raffle prizes. Many ski shops and outdoor shops can help you fit and purchase skijoring equipment. Skiers may skijor on the Seeley Hills Trails, Seeley, Wisconsin. From County OO take old Hwy OO to the trailhead.